New technology from Kongsberg's autonomous vessels program will contribute to improving the operational and safety performance of manned vessels with the launch of a new generation of Integrated Bridge System (IBS), which is being presented for the first time at SMM 2018 in Hamburg this week. While Sensor Fusion informs the autonomy controller of an unmanned ship, Kongsberg's application of the technology in its new IBS for crewed vessels introduces a new level of awareness for bridge crew, by delivering a holistic real-time navigational picture based on precise data from diverse sensors. The result is a seamless, user-friendly presentation of vital data and more effective operation of navigation, remote control and advanced maneuvering, automation, energy management and safety systems. 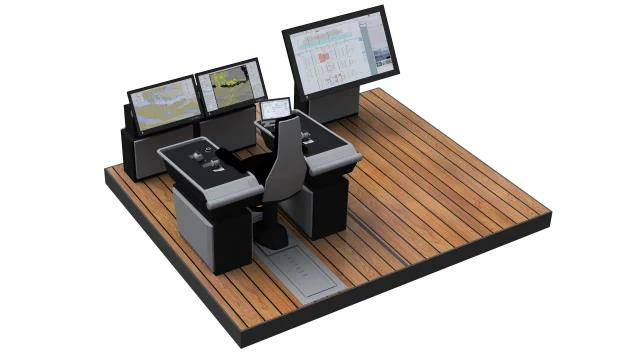 Already established as a technology-leading supplier of standardized and customized bridge systems for a wide range of vessels, Kongsberg Maritime has also further developed several key functions to deliver improved safety, especially in slow-speed situations. A new all-speed autopilot combes traditional autopilot and trackpilot functions with joystick and dynamic positioning into a single, common control logic, working from high-speed transit down to zero speed electronic anchoring or station keeping. Additionally, new automatic docking and soft thruster assist functions improve safety for critical operations. For passenger and cruise vessels, Kongsberg has also introduced a new full-size safety management and control system. "Designed to meet all IMO and classification societies' requirements, our new generation IBS is all about the integration. It adds significant new technologies to deliver safer and more effective navigation and vessel operations, either as a standalone solution, or integrated with a full KONGSBERG vessel delivery featuring automation, data handling and energy control systems," said Roger Trinterud, Senior Sales Manager, Kongsberg Maritime.